The ACT staff work on activities with the students that encourage them to communicate their feelings. This reduces the likelihood of students acting out or becoming aggressive or self-abusive. To achieve this goal, we seek help from behavior specialists at public schools or other Behavior Intervention Services as needed by the student. We focus on gaining respect and improving student self-confidence at our program. Teachers don't use obtrusive or restrictive methods except in a crisis situation. We send each staff member to Crisis Prevention Intervention (CPI) training. There, trainers place a strong emphasis on using verbal skills to find the cause of a student’s anxiety, anger, sadness or frustration. 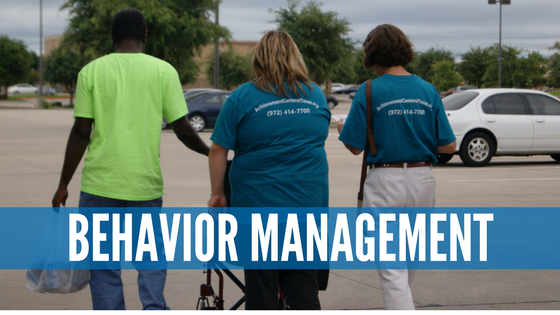 How Do Teachers Improve Special Needs Behavior Management? Trainers advise our teachers to restrain the student without retaliating. This reduces risk of injury to themselves, to the frustrated student and to the other students in the classroom. When our teachers sense tension, they practice redirection. Time out consists of sitting on a bench or chair approximately five to 10 feet away from the center of activities. It never lasts more than 15 minutes. We set up "Frustration Stations" so that students have a safe place to go when they are upset, tired, angry, agitated or sad. This space allows them time to calm down and work out their feelings of frustration. An example of a “Frustration Station” is our Sensory Motor Training Lab. All the mats in this room serve as a cushioned, safe setting that allows behavioral outbursts to run their course. All the sensory experiences that can be had in this room also distract from the frustrated feelings that led to the outburst in the first place.